FBReader is undeniably one of the best ebook reader apps available on the Android platform. Besides a comprehensive feature set, the app also lets you obtain ebooks from different sources, including the Calibre library stored on your machine. This is, indeed, a nifty feature which can be used to effortlessly transfer ebooks from an existing Calibre library to your Android device. To make use of this functionality, you need to enable Calibre's built-in content server first. To do this, launch Calibre on your machine, press the Connect/share button on the main toolbar, choose the Start Content Server command, and note the IP address of the content server. Launch FBReader on your Android device, tap on Search on the main toolbar, then tap on Add Catalog. Specify the URL of Calibre's content server which should look something like this: http://192.168.1.9:8080/opds (replace 192.168.1.9 with the actual IP address of the content server). 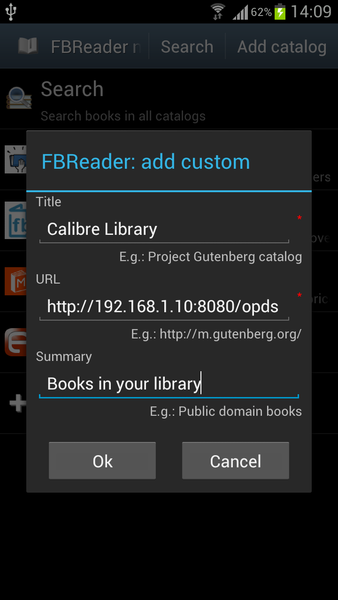 Tap OK, configure the available options if needed, and tap OK. You can then browse the ebooks in your Calibre library and download them to your Android device directly from within FBReader.